The Mountain Thunder was a street race held on Easter Saturday in Methven. 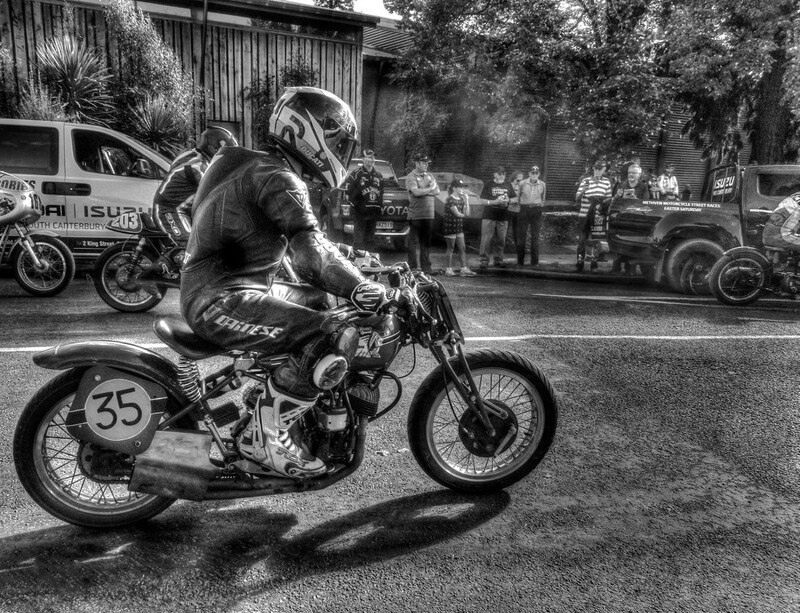 We were there to support Lee Munro, seen here with his 1941 Indian about to race. Very exciting until there was a fatality. Then the racing was cancelled. The guy was a young fella on a high powered motor and not used to the sharp turns and twists of a street race. 1. It wasn’t Lee. His Great Grandfather and John’s Grandfather were brothers so there is a family connection. Lee is going to ride a modified bike for a new record at Bonneville this August. 2. The noise of thunder and the dedication of these bikers to compete is to be admired. 3. I took this photo of Lee racing out on to the circuit and my camera said 12.41pm. The accident happened at 12.50pm! But I had headed back to our hotel by then! Great shot, so sharp and focused. Perfect b/w. Sad to hear of the accident though. @philcameron59 That's what I think too, Phil! Someone's son, friend, brother. A great shot and processing, so sad that the event ended in such a manner, our thoughts are with the lad's family and friends. A great image Maggie! So sad to hear about the tragic accident! Heartbreaking for his friends and family. Fav for your b&w image! Love it! Excellent capture of your friend. A death on the circuit brings home the dangers and the courage of those who face it. Beautiful classic photo. So very sorry about the motorcyclist who lost his life. Thanks Lou Ann - it somehow seems so unnecessary - but it is a dangerous sport! @lynnz The sun shone this day - after a week of rain and even the following day, it rained. They were lucky but one guy wasn't! @maggiemae I guess the only way to look at this is that he died doing what he loved to do, that has to help his family, I'm sure they have already thought of that. That's very sad about the fatal accident :( but this is a beautifully processed shot and very cool subject. Nice bike, shot and processing. Great capture and the bike looks in fabulous condition. Very sad to hear that someone died. Great shot in black & white. Reading this really conveys the danger involved in this sport. It's a fantastic capture/portrait in context, and all the more poignant given what was about to happen. @taffy I thought that too - it wasn't in this race but the next one, Taffy! I saw about that accident in the news. That's really sad! Great photo - love the action. Interesting that he is trying for the Bonneville record. That is keeping it in the family!! @redy4et Being concerned means that you are thinking ahead and being careful! All good! My goodness. I sorry to hear there was a fatality but I too am grateful it wasn't your Lee. I do like the feel of the shot - the folks in the background, with the soft focus and your narrative give it a completely different feel - I like that you get a different feel depending on where your focus falls. @elatedpixie It takes a while to get to know your camera and then can actually do this Phylm! But I know what you mean. A lovely image in b&w. A real shame that there was a terrible accident. Great in b&w, especially the shadow. Great capture, and a big FAV. Very tragic turn of events though. So sad. Fantastic black and white- great for the subject matter. So sorry to hear about the tragic death of the young biker. It truly puts a damper on an exciting event. I really like this picture. Lovely B&W. Sad about the rider who lost his life. @mbrutus These guys are really dedicated to their motorbike racing - I hope I transmitted that feeling here! Great shot but sorry to hear about one of the bikers. So sad.